Bert and Mary Anne Sirkin reside in West Hartford, CT and travel occassionaly to some "photo" destination. Bert is the "technician" and Mary Anne is the "scout". It takes the two of us to compose and "capture" photos. Here are a few photos of us in "high" places. 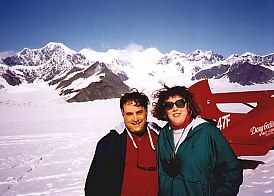 This photo was taken with a Nikon One-Touch (point and shoot film camera) by the pilot of the bush plane that took us to a glacier at the 5,500 foot level of Mt. McKinley (renamed to Mt Denali in 2015) in Denali National Park in Alaska. The plane took off on wheels and landed on skis on the glacier. 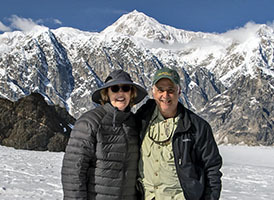 Mount McKinley/Denali is 20,320 feet, the highest mountain in North America, and although hard to tell from the photo, the peak is 8,000 feet above and directly behind us (with the blowing snow on it). "It was a bad hair day!" In the same place! Amazing what a few years and a good camera makes! 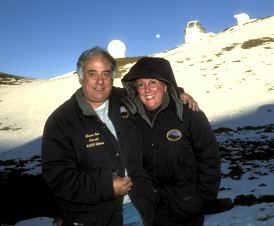 This photo was taken on top of Mona Kea on the "Big Island" of Hawaii. And, yes, that's snow at almost 14,000 feet (the mountain is actually 33,000 feet if measured from where it starts at the sea bed) . We drove up the mountain in a 4-wheel drive vehicle. It was about 22 degrees, windy, very dry and lacking in oxygen! If you live on the Big Island, you can ski and swim in the same day! This picture was taken on top of the Männlichen (about 7,300 ft) in Wengen Switzerland. 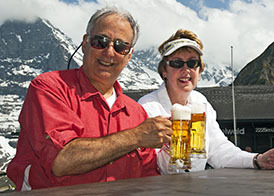 Directly behind us is the Jungfrau (11,300 ft) - the highest mountain in Europe.